The crawler kit was a big pain to build, but it looks cool! It is essential to use the correct screws and nuts exactly as described in the instructions. Long screws and lock nuts are at the "knees," tapping screws in the pivots, and a nice comfortable drilled hole for the servo horn. CODE! The robot is functionally identical to the standard "navigation with whiskers" bot but the whiskers are higher from the ground and bounce up and down. In general - it is far less reliable. Any code included for turns should have durations about four to six times longer to allow for the added turning time of the crawler. If you break your servo horn while cutting/drilling the extra space for the bolt, don't worry too much: The other three spokes will do just fine. If you completely break your servo horn, the horns that came with the original BOE Shield kit work fine. Don't let the diagram on the middle legs confuse you - they're both assembled the same way. Double check your washers before tightening the bolts on the middle legs. The one closest to the servo horn is a 1/8" spacer and looks twice as thick as the other nylon washers. Needle-nose pliers are very useful in tightening those lock nuts - but don't over-tighten them!A good measure its to tighten them just enough to allow the friction of a leg to keep it from spinning downward with gravity, then slightly loosen it from there. I'm a big fan of Parallax and adafruit industries, so was glad to learn that they are now stocking the Parallax BOE Shield for Arduino. I already owned this kit but have yet to have time to play with it. The video above is an unboxing of the BOE Shield, PING))) sensor mounting bracket, and crawler kit. 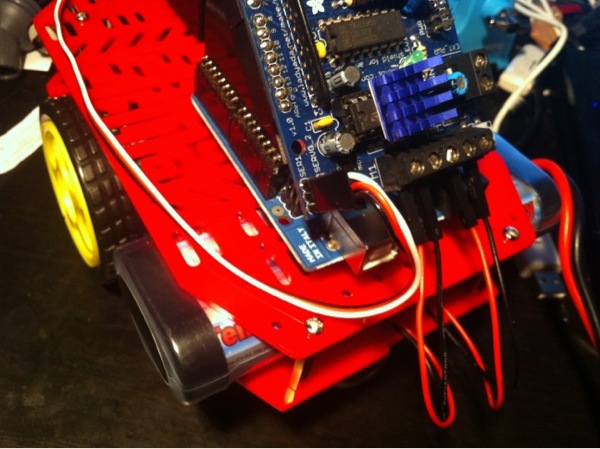 The original Parallax BOE-Bot uses Propeller controller and is very good for learning robotics in that environment. The lessons, documentation, and examples are quite detailed. With a focus on education, Parallax wisely decided to expand this platform into Arduino territory. The only "required" pins for the shield are two of 10, 11, 12, and 13. You can choose which two in your Arduino code. The rest can be used with your normal stackable Arduino shields. To get a general idea of the BOE Shield and completed robot in action, take a look at adafruit's new product announcement. Here's a photo of the crawler kit sitting on an original BOE bot (borrowed from Parallax's site) that I intend to use with the BOE Shield. I'll be posting all my source code and a bunch of pictures or videos, but it will all pale in comparison to the online book from Parallax. I am satisfied with the Magician Chassis that I picked up from Sparkfun. So many mount points!